Born in Argentina, César Pelli came to the United States in 1952 and quickly rose up the ranks of the architecture world. He made a name for himself as a partner at Gruen Associates where he designed the initial building at the Pacific Design Center in West Hollywood and the United States Embassy in Tokyo. While working as the dean of the Yale School of Architecture, he also started Cesar Pelli & Associates, which was commissioned to design the expansion and renovation of the Museum of Modern Art in New York. That led to more and more work around the United State and the world, including Brookfield Place, which was known as World Financial Center in Manhattan’s Battery Park. Pelli was named one of the ten most influential living American Architects by the American Institute of Architects in 1991. Four years later he was awarded the American Institute of Architects Gold Medal. All the while, he continued designed groundbreaking buildings around the globe. In 1997, work was completed on The Petronas Towers, two postmodern skyscrapers in Kuala Lumpur that were the tallest buildings in the world from 1998 to 2004. A year later, his designs for the National Museum of Art in Osaka, Japan came to fruition. This was also when the firm changed its name to Pelli Clarke Pelli Architects in order to denote the significance of senior principals Fred W. Clarke and Rafael Pelli. 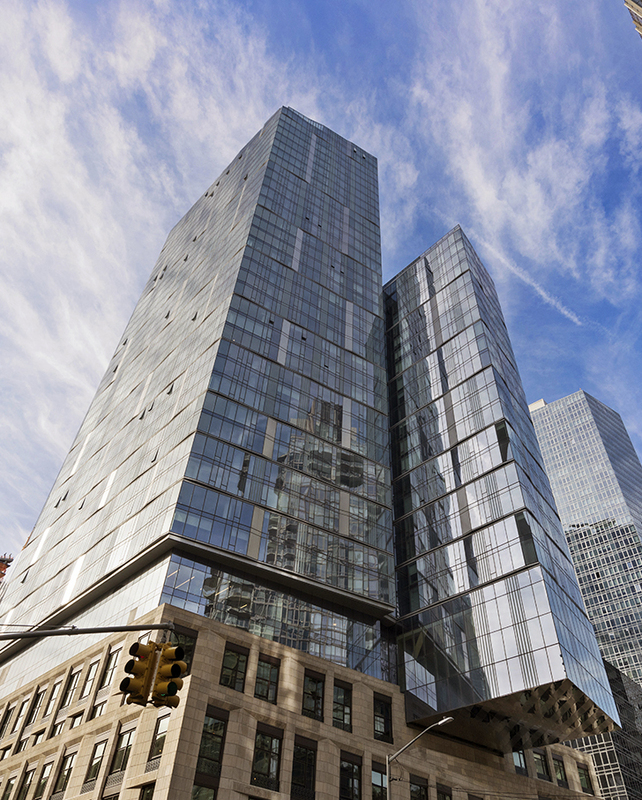 While their work takes them all over the world, Pelli Clarke Pelli still always seems to have something going on in New York City. Their latest project is One West End, a sculptural glass residential tower in the Upper West Side. As one of five new towers in the long-awaited Riverside Center, One West End rises from a full city block between 59th and 60th streets overlooking the Hudson River to the west and the southern edge of Central Park to the east. Developed by Elad Group and Silverstein Properties, this luxurious new building is a new gem of Manhattan’s already gem-packed Upper West Side. This 42-story luxury residential tower includes 246 condominiums. Most of them range between one and four bedrooms while penthouses and duplex homes are also available near the very top. The vision behind each residential design comes from Jeffrey Beers, one of the top hospitality designers in the world. Bringing a combination of thoughtful planning, innovative design, and a melding of architecture and craft, Beers and his firm create timeless living spaces that people line up to call home. Residences in One West End come with plenty of high-end features, including custom walnut entrance doors, wide-plank hardwood floors, floor to ceiling windows, and flexible entertainment spaces. The Italian-crafted Scavolini kitchens include marble slab countertops with waterfall edges and a collection of Sub-Zero, Miele, and Wolf kitchen appliances. Residents can choose between dark-stained or light-stained walnut finishes in the kitchen as well as between white oak or walnut flooring. Bathrooms come complete with Dornbracht fixtures, Toto water closets, Scavolini cabinetry, marble countertops, separate powder rooms, and heated marble floors. The amenities available to residents here are described as resort-style and that’s a label that is well earned. One West End boasts over 35,000 square feet of resident-focused amenities that meet every need. A 75-foot swimming pool rests under a double-height cantilevered atrium and a wellness center with a fitness area and spa overlook it. In the spa, residents get pampered in private spa treatment rooms for massages or facials. A 12,000 square-foot terrace includes cabanas, greenspaces, grillings areas, and outdoor entertaining space. A chef’s kitchen allows for both private dining parties and culinary events. There is also a living room with a fireplace, a media room, billiards room, game room, and a children’s playroom to make sure all types of residents have an amenity space to find respite in. One West End provides plenty of services for those amenity spaces. A full-time lifestyle director and lifestyle coordinator will be available to help residents do or see whatever they want. They’ll be on-hand to help with travel, business & professional services, pet service, home care, child services, beauty and personal care, and more. There is also on-site parking and resident storage available. While there is so much to like about what’s happening inside One West End, it’s worth noting just how many opportunities exist just outside its doors. The Upper West Side location puts residents within walking distance of so many world-class experiences from dining, culture, shopping, and entertainment. Residents can walk or bike west to Hudson River Walk to enjoy sunny days or make their way east just a few blocks to Central Park. Lincoln Center (Metropolitan Opera House, New York Philharmonic, New York City Ballet), Columbus Circle (Williams Sonoma, Momofuku Noodle Bar, Landmarc), the Theater District, and Hell’s Kitchen are all easily accessible, putting some of the city’s finest restaurants and cultural experiences at your fingertips. There are also quite a few of the finest schools across all age levels within walking distance, including Museum Magnet School, LaGuardia High School of Music & Art and Performing Arts, The Julliard School, and John Jay College of Criminal Justice. In terms of availability, One West End currently has a collection of three-bedroom and four-bedroom residences to choose from. The three-bedrooms range from 2,246 to 2,866 square feet and from $5,250,000 to $5,770,000. The four bedrooms range from 2,815 to 3,204 square feet and from $5,995,000 to $8,175,000. There is also one two-level unit available, a 4+ bedroom residence with 8,500 total square feet that includes a massive outdoor terrace and double-height great room that is available for $19,500,000. One West End is taking luxury living on the Upper West Side to all new heights. There’s no better time than right now to consider calling this your new home.